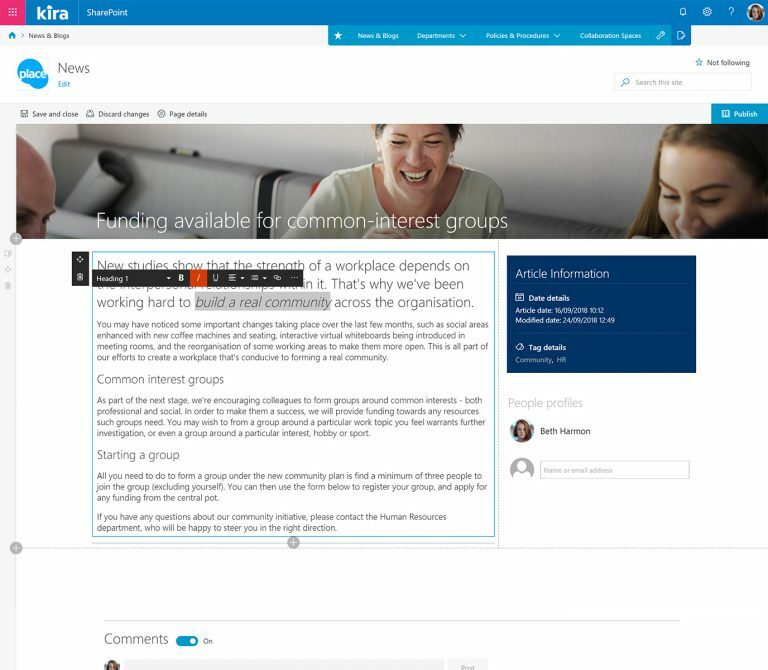 Discover the Office 365 intranet that’s built for a better employee experience. 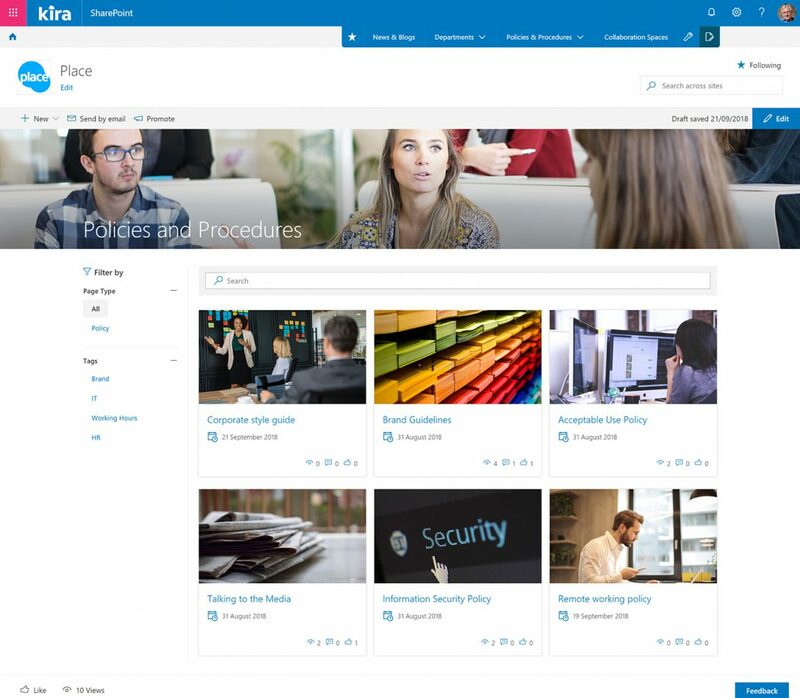 Kira is the intranet that empowers your organisation to get more done. Its straightforward interface and powerful publishing tools enable your colleagues to communicate and collaborate better. And it’s designed to integrate completely with Office 365, becoming the core of a really transformative digital workplace. We've designed Kira with mobile in mind, so your staff get a great experience no matter what device they choose to use. Kira works hand-in-hand with SharePoint Online to support assistive technologies, enabling accessibility for everyone. Build a truly collaborative digital workplace that enables employees to communicate, not just top-down messaging. We've made it easy for content creators to tag their work with rich metadata. You'll find the Page Properties panel on every article, page and policy. Set things like tags, target departments and locations, publishing priority, expiry dates and more. Once a page is tagged, the data is used instantly to personalise the homepage and radically improve findability across the site. With Kira's visual page editor, what you see really is what you get. Kira's drag-and-drop page editing experience lets you create a professional page layout in seconds, letting you focus on getting your message across. You can even enhance your content with images, embedded documents, streaming video, live conversations and even interactive maps. There’s loads of SharePoint intranets out there, and they all do much the same thing. So what makes Kira different? Kira helps you achieve real digital transformation. By boiling down years of experience into Kira, we can give you a platform that equips your organisation for the future. That’s not just flashy marketing speak: we use Kira to help our customers transform into truly digital organisations. Kira builds on the capabilities of Office 365, turning it into a rich, satisfying digital workplace that your colleagues will love to use. It already features everything you’d expect from an intranet — news articles, pages, blogs, events, social media integration. So we won’t bore you with those. They’re there, and they work great. Add in streaming video, auto-personalised homepages, sentiment analysis and metadata-driven search, and you start to see why our customers tell us they love Kira. What’s more, Kira is exceptionally closely-aligned to Microsoft’s vision and roadmap, meaning everything’s seamlessly integrated, and you’ll get the latest Office 365 features as early as possible. 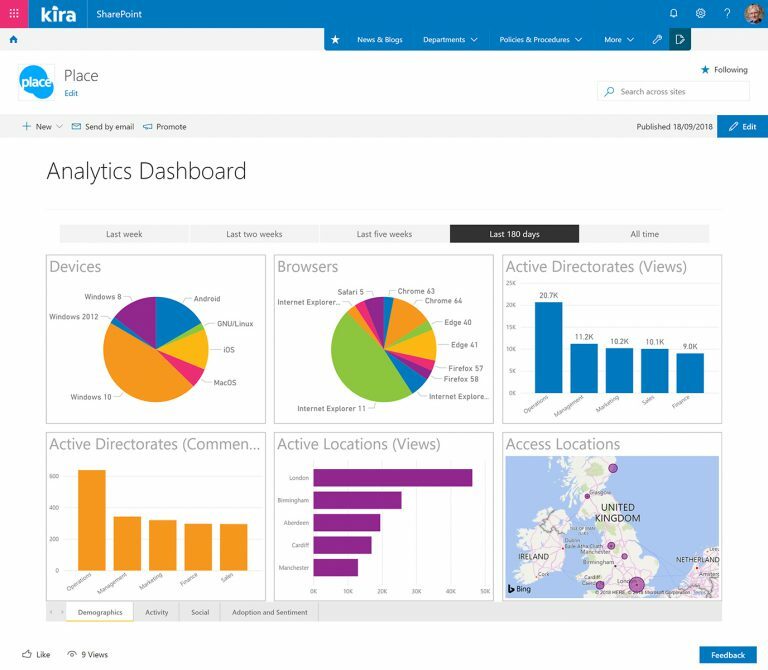 You'll have access to data broken down by device, browser, department and location, as well as sentiment analysis in Kira's analytics dashboard. So not only will you know how many page views you've had, but who was looking - and how they felt about it. Enjoy a great employee experience and high user adoption thanks to the people change expertise we've lovingly poured into Kira. Find pages, files and even people instantly - and Kira's search is powered by Microsoft Graph, so it's tailored for each user. Nobody likes having to wait. Kira can be deployed into your Office 365 tenant in just a few short hours. Help your staff find pages of a particular type (such as policies or blog posts) in seconds with Kira's document centre component. Results bubble to the top as you enter your search query, and can be filtered further using tags, or any other metadata you choose. Quickly create dynamic menus that match your employees' mental models of your organisation. Have multiple sites themed for sub-brands, with a common navigation bar uniting them all. Your Kira subscription includes updates to each latest version, so your intranet is always at the cutting edge. You'll get a platform that's constantly getting better, based on customer feedback and our team's innovation. The team who create Kira can also help you get a lot more out of your investment in the platform. 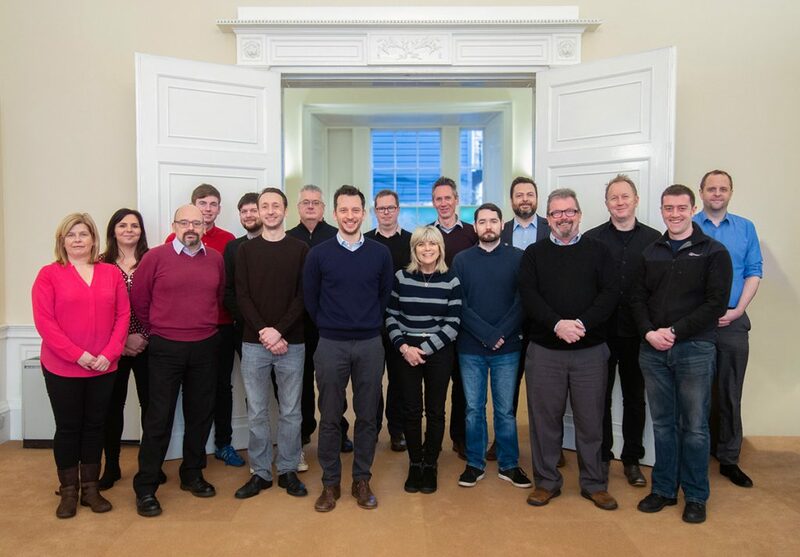 We've helped customers like Scottish Water to build award-winning digital workplaces on the foundation of Kira and Office 365. If you'd like to build a digital workplace that helps transform your organisation for the better, just drop us a line. Want to know more? Drop us a line for a chat and a demo. Kira is designed and developed by CompanyNet. We’re an independent software solutions company with more than 20 years’ experience. We help organisations drive more value out of Office 365 — through products like Kira, and the expertise of our professional services and managed services teams. Our starting point is always people, not technology, because there’s no point in building something if nobody wants to use it. We’ve used our extensive people change experience to design Kira for high user adoption. It’s backed by our own tried-and-tested frameworks that will help ensure your intranet is a huge success. …we’re always happy to discuss how we can help.